Sophie Taylor: This time of year I get bored. No matter where I've lived, in New York, New York, the Hamptons, or Gracious Grove, New York, there is something about this time of year that just makes me crazy. Maybe it's the gray skies, maybe it's the after holiday blues, but I need something to keep me busy. So, for my grandmother's Silver Spouts teapot collecting group, I decided to do a little research on outdoor teaparties. I saw a blog online called Vintage Eats, run by this woman, Jaymie Leighton, and she did a summer column about having an outdoor tea party for a wedding shower. I got interested, and now my research has changed... I'm starting to think about expanding Auntie Rose's Victorian Tea House to have an outdoor tea garden! I thought I'd call a few people, starting with Jaymie Leighton, for advice. Jaymie Leighton: I was so surprised to get Sophie's message and called her. She's like me, an entrepreneur at heart. And it's nice that she's thinking ahead, using the winter months to think about a project for her grandmother's tearoom. I told her what I thought... an outdoor garden tearoom experience sounds awesome! For what food to serve, I suggested my sandwich loaf experiment... 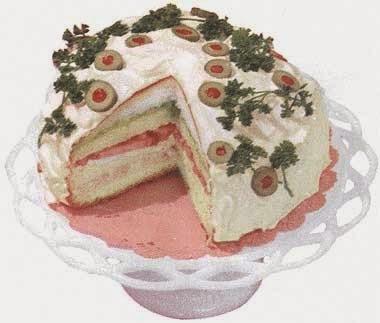 I can't imagine anything prettier for an outdoor tea party than a frosted sandwich loaf. But when she asked about what teapots I used, and all that, I had to point her somewhere else. I don't collect teapots, but my sister sells stuff like that, so I passed her on to Becca, who gave her a number of another teapot collector to call. Merry Wynter: Imagine my surprise when I got a call from a young woman not too far away, in Gracious Grove, New York. As I told Sophie Taylor, I've been through Gracious Grove on my way... somewhere or other. I'm still finding my way around the upstate area and often end up off the beaten trail even if I'm on my way to Buffalo or Rochester. Which is fun for me, since I've spent most of my life in the city, or flying off to other parts of the world. But teapots I know. We discussed her collection, and what she was whiling away the winter months with, planning outdoor tea parties - sounds like a wonderful idea, and one I may just steal for Wynter Castle - but my advice was that she focus on making her outdoor teapots shatter proof, if not dent proof! I was thinking of patio blocks and fine china... not a good mix! She'd be wise to expand her collection of art deco metal teapots or those cute ones that have metal cozies. They're not my cup of tea (Ha!) but they'd be practical. And muffins... she has to serve muffins! Sophie: What started as a quest for information and inspiration, became a nice chat with two wonderful new friends. So... what do you do when the winter blahs get to you? As for me, I'll be planning out Auntie Rose's Victorian Tea House's newest venture next summer... outdoor tea parties... weather permitting. If Mrs. Thelma Earnshaw sees me trudging around the backyard of Auntie Rose's in galoshes muttering to myself, I'm sure it will make her day! Check out the Teapot Collector Mysteries on the web, on Facebook and on Pinterest, and watch for the promotional launch of Victoria Hamilton/Amanda Cooper release of Shadow of a Spout, book 2 of the Teapot Collector Mysteries, as well as recipes from Victoria's other two series in The Cozy Cookbook, being released the same day! Reading is one of my passions and with all the new mystery books coming out, I'm never at a loss for some thing to read. Keep those mysteries coming! I also enjoy doing some crafts during these quiet and cold winter months. Crafts are an awesome way to pass the time in winter! FRIENDS!! What would we do without them? I don't get the winter blahs... I just like to lay around with my blanket and a great book. 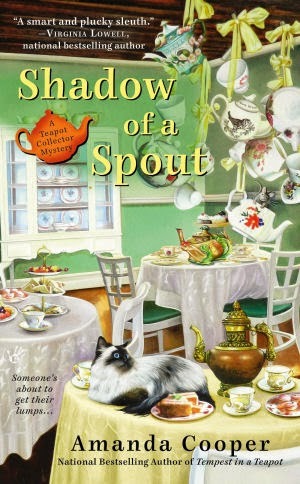 Looking forward to reading Shadow of a Spout. LOL... a blanket and a book are *awesome* ideas for winter. The couple of years that I worked in a coffee shop, the wonderful teapots that we sold always tempted me so much! I did buy a couple of really cute ones but now I don't have anywhere to display them. Teapots are fun! This series sounds fun! A place to display them is a problem! I have a teacup rack, but the teapots that I do have are along the top of my cupboard! I really enjoy all of your books.